October 2, 2015 marked GBMC HealthCare's 50th anniversary of providing high quality, compassionate care to the greater Baltimore community. All year long, the organization has been celebrating its accomplishments and recognizing its many dedicated physicians, nurses, employees, volunteers and donors. Click here to watch messages of thanks from GBMC to those who have given so much of themselves for the health of the community. As a part of the celebration, GBMC HealthCare partnered with ABC2 to produce a 30-minute TV special, "GBMC at 50," which aired on September 30 and October 10. It's more than GBMC's story, though. It's also about Baltimore, America and the Towson community. If you missed the special and would like to watch it, visit www.gbmc50.com. While you're there, please take a moment to read some of the truly inspirational stories submitted by GBMC HealthCare patients over the past year at www.gbmc50.com/ourstories. Additionally, more than 1,300 members of the GBMC HealthCare family gathered at the Baltimore Convention Center on October 2 for the 50th Anniversary Gala. To view photos from the gala, click here. GBMC HealthCare looks forward to many more years of delivering better health and better care at a lower cost with more joy! Speak Up about Breast Cancer! Although October is breast cancer awareness month, any time is a good time to speak with a physician about breast cancer. According to the American Cancer Society (ACS), about one in eight women in the United States who live to age 85 will develop breast cancer during their lifetime. Fortunately, breast cancer is a very treatable disease! One of the most important things a woman can do for her health is to talk with a primary care physician (PCP) about her risk factors for breast cancer. The PCP will help establish an early detection plan (when it is appropriate to begin receiving regular mammograms for screening purposes). Contrary to popular belief, women are not the only ones at risk for breast cancer. Although rare, men of Ashkenazi Jewish heritage and those with extensive family histories of breast, prostate, ovarian, pancreatic or skin cancers may also be diagnosed with breast cancer and should speak with their PCPs about close surveillance. 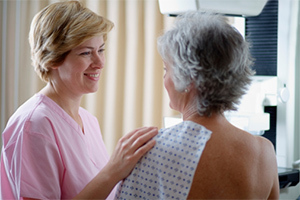 After assessing an individual's risk, a PCP is able to order tests such as mammograms, ultrasounds or biopsies to examine breast tissue. For more information about your risk for breast cancer, speak with your PCP. if you do not have a PCP, visit www.mygbmcdoctor.com or call 443-849-GBMC to find one who is right for you. With talk of "gobbling 'til you wobble" on Thanksgiving and surgarplums and lollipops dancing through children's heads, the holidays are known for their rich, delicious food. Eggnog and donuts can make for challenging New Year's resolutions, though; research indicates that most Americans never lose the weight they gain during the holidays. How do you make eating well during the holidays delicious? Perhaps you're known for your "skinny" shortbread cookies. Maybe you've perfected pumpkin granola or mastered lightened-up latkes. Use of vegetables, fruits, lean meat and whole grains is encouraged! Ingredients should be minimally processed and reduced fat wherever possible. Submit your recipe here and you could win one of three great prizes! GBMC employees are welcome to enter, but must do so from home or via mobile device. Entry dates: November 1, 2015 at 12:00 a.m. - November 15, 2015 at 11:59 p.m.
Voting dates: Monday, November 16, 2015 at 12:00 a.m. - Sunday, November 22, 2015 at 11:59 p.m.
First Place: $100 Gift Card to Giant Food; Recipe featured in an upcoming edition of Living Healthy, Living Well! Every one of us has a story we can share. 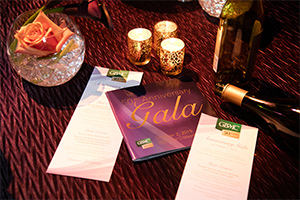 Think of a past event in your life related to GBMC. Whether it’s care you received, an opportunity you have, or a loved one you remember, this event should have very personal meaning to you. What’s happened in your life since your experience at GBMC? 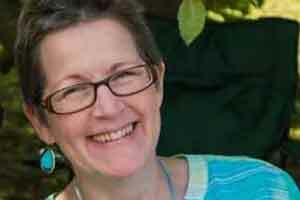 Read Susan Alban’s story below, and share yours at www.gbmc50.com/mystory. Susan Alban’s Story: "Because of GBMC, I Am Cancer-Free"
I joined the GBMC family on September 14, 1987 as a laboratorian. If you know anything about laboratorians, you know that we are a “behind the scenes” type of people. We love and care for our patients with the same compassion and dedication as others in the hospital, just from the comfort of the laboratory. Most of us don’t venture out unless we have to, so we miss the opportunity to see our other GBMC family members. In the spring of 2013, I was led to find out more about my cousins -- the cousins by blood on my father’s side of my family and those here in my GBMC family. In April 2013, I was diagnosed with Lynch syndrome, a genetic predisposition to a variety of cancers, with colon and endometrial being the most prevalent, and a lifetime risk between 60- 80 percent. Lynch gave me a bridge of communication to my “blood” cousins, some of whom I had never met, so I am thankful for that since the syndrome has already wiped out the two previous generations and half of mine. Lynch also gave me the chance to meet many of my GBMC cousins! Christy Haakonsen in the genetics center broadened my knowledge and helped me decide on a prophylactic hysterectomy, and that led me to meet Dr. Francis Grumbine for my surgery. Then, because we found cancer, I was able to meet Dr. Paul Celano and the awesome team in the Sandra & Malcolm Berman Cancer Institute when I went for chemotherapy. And, because I wanted to know everyone I possibly could, I was fortunate enough to meet Dr. Geoffrey Neuner and the friendly gang in Radiation Oncology! It has been quite a journey these last two years, but I would not have wanted to experience it anywhere but here. My coworkers were so supportive, filling in for me where they could, donning hats the first day after I shaved my head, learning more about Lynch or just having a friendly smile when I needed it most! I have been here at GBMC for over half my life and am very thankful for the ability to provide for my family through working here and for the great team who has helped me to become cancer-free! I would not have wanted to be anywhere else! Thank you, my GBMC family! I may never be fully out of the watchful eye of the docs here at GBMC because of my Lynch syndrome. But, because I am currently cancer-free and feeling stronger every day, I am able to continue my journey as part of the GBMC family, providing excellent care so others may continue to have successful stories! Preheat the oven to 400 ºF. Heat the vegetable and sesame oil in a large wok or sauté pan over medium heat. Add the ginger and garlic. Stir fry quickly, about 30–45 seconds. 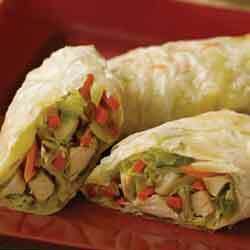 Add the cabbage and carrots. Continue stir frying until the cabbage is soft, about 2–3 minutes. Add the chicken and soy sauce. Toss the mixture well and heat it through. Remove the mixture from the pan, and place it in a large colander to drain. Recipe Source: Reprinted with permission from Keep the Beat™ Recipes: Deliciously Healthy Family Meals. U.S. Department of Health and Human Services. National Heart, Lung, and Blood Institute. NIH Publication No. 10-7531. Page 11. December 2010.